CrystalClear Nature's Choice Barley Straw Pellets utilize barley degradation technology to help manage pond problems throughout Spring, Summer, Winter and Fall. When placed in an area of the pond where there is a steady water flow, the barley pellets will slowly degrade. 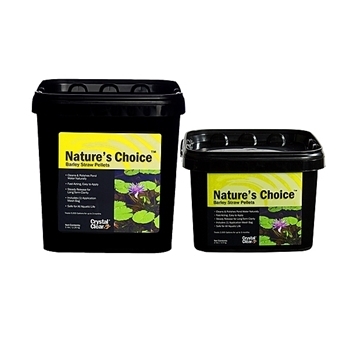 As the pellets degrade, they emit a substance that assists in keeping your pond clean all season long. Do not apply Nature's Choice Barley Straw Pellets any other rate than the rate prescribed above.